10. God will be pictured as male and described in masculine terms 90% of the time. 8. Biblical characters of your own gender will be featured as primary subjects and as positive examples 90% of the time in the educational curriculum. Male characters will be featured in the children’s curriculum, and in the youth group curriculum, and in the Sunday morning sermon, and in the small group studies…you get the idea. The above are 2 of the 10 Ways Male Privilege Shows Up in the Church, in a recent post by Ms. Gail Vaughn Wallace at the Junia Project. When my kids were young I found a copy of a Sunday School lesson pamphlet for the ages of 3rd-4th grade. It purported to be a picture of the story from Acts about Apollos learning from Priscilla and Aquila. What it depicted was Aquila and Apollos sitting at opposite sides of a table, with Aquila gesturing as though explaining, and Apollos intently listening. Where was Priscilla in this picture? Off to the side, her eyes demurely downcast, her mouth closed, as she arranged flowers in a vase on the table, clearly not part of the lesson at all. I was furious, but didn’t have the nerve in those days to say anything about it. You can bet I would today! That cartoon gets more disturbing the longer I look at it. 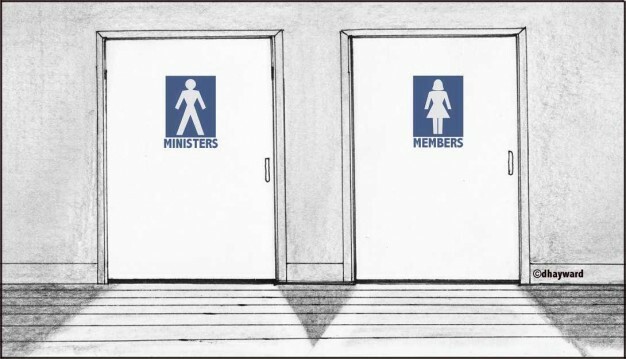 From a Roman Catholic perspective, first of all, it’s a little amusing that our ministers (priests) actually wear “dresses” over their pants, so the graphic is a bit off. But more than that, the argument for the male-only priesthood rests really, really heavily on the priest acting in persona Christi, over against the people who are the church who is the Bride of Christ. So the priest must be male, it is argued, not only because Jesus’s human form was male, but because a bridegroom is necessarily male. I’ve talked a lot about the infantilization of the laity in a clericalized church, but maybe I should be talking about the feminization of the laity in a patriarchal church: except I don’t want to, because feminization only implies inferiority and passivity and docility in a patriarchal system. Kristen, what an awful illustration of “(Priscilla and) Apollo.” Bleah.